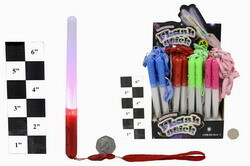 3 Function 19cm lightstick with different colour LEDs that flash & strobe sequentially. Perfect for Clubbercise. Usually available with Red, Pink, Blue or Green handles. A selection will be provided for your order quantity.